The CD can be conveniently purchased on the shopping cart. Add MorphVOX Pro to your cart, and on check-out, check the box next to "Add a MorphVOX Backup Disc"
The CD includes MorphVOX Pro in 4 languages, plus many of the free audio packs, effects and product trials. 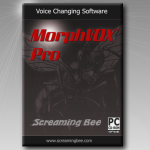 Everything you need to enjoy MorphVOX Pro! SwiftCD provides reliable and efficient delivery of the backup CD anywhere in the world.